↑ १.० १.१ १.२ १.३ १.४ UNESCO. 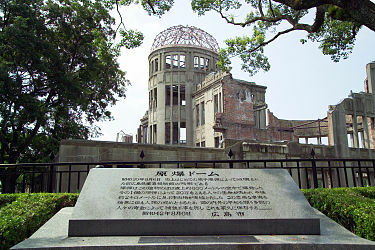 "Hiroshima Peace Memorial (Genbaku Dome)". ↑ २.० २.१ २.२ २.३ २.४ "原爆ドーム [A-Bomb Dome]" (in Japanese). 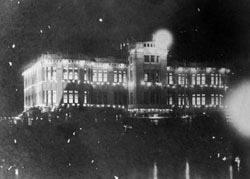 Nihon Daihyakka Zensho (Nipponika). Tokyo: Shogakukan. 2012. OCLC 153301537. http://rekishi.jkn21.com/. Retrieved 2012-09-18. ↑ ६.० ६.१ Van Rhyn, Mark E. "Hiroshima, Bombing of". PBS. Retrieved 29 March 2013. ↑ Schofield, John and Cocroft, Wayne (eds.) (2009). A Fearsome Heritage: Diverse Legacies of the Cold War. Left Coast Press. ↑ ८.० ८.१ Ide, Kanako (Winter 2007). 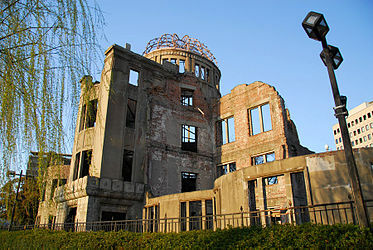 "A Symbol of Peace and Peace Education: The Genbaku Dome in Hiroshima". Journal of Aesthetic Education. 4 41: 12–23. http://muse.jhu.edu/journals/jae/summary/v041/41.4ide.html. Retrieved 10 February 2014. ↑ Milam, Michael C. (July–August 2010). "Hiroshima and Nagasaki". Humanist (Buffalo, N.Y.: American Humanist Association and the American Ethical Union) 70 (4): 32–35. ↑ "浜井信三 [Shinzo Hamai]" (in Japanese). Nihon Jinmei Daijiten. Tokyo: Shogakukan. 2012. http://rekishi.jkn21.com/. Retrieved 2012-10-23.